Knowing effective CPR and AED rescue techniques can make the difference between life and death. Many workplaces, schools and health care institutions require employees and students to be certified in first aid, CPR and / or CPR training with a credible provider. The most popular provider that offers Ontario WSIB approved certification in Mississauga is Mississauga First Aid. Low prices, great customer service, knowledgeable teachers and a wide range of courses. Food safety, on-line workplace safety, re-certifications, private programs and a wide range of services including AED sales is available with this Ontario provider. Popular courses include stand-alone CPR classes such as CPR level “C” and health care provider CPR level “HCP”. The most popular WSIB approved first aid course is standard first aid which is a two day program that includes CPR and AED certification. 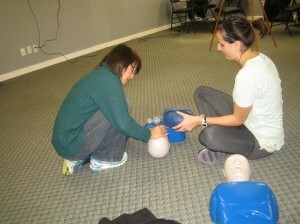 For a complete list of available training classes, visit the Mississauga First Aid website here. Trainees can complete their enrolment on the registration form on the website or through e-mail, telephone call, or walk-ins during business hours at any of the training centres. Customer service representatives are available 7 days per week. 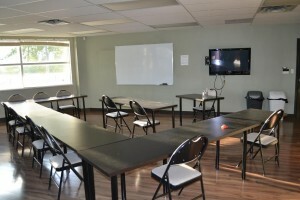 First aid and CPR training classroom in Mississauga, Ontario. To register for any of the above courses or to inquire about the services available in Mississauga use the contact information posted above. Trainees who are able to complete a course are awarded a St Mark James training certificate, valid for 3 years throughout Canada. The certificate will be able to meet whatever requirement or purpose the trainee needs it for. Mississauga First Aid proudly offers the most affordable prices in the region. Rates are inclusive of taxes, certification fees, and training manuals. Full refunds are given to trainees who drop out of a course, provided a 72-hour notice is given beforehand. All of the training facilities are conveniently located within walking distance to public transportation and free parking. Classes are well maintained and outfitted with the latest training equipment for CPR and first aid training. Alcohol poisoning is a very serious condition that can cause shock and organ failure if untreated. If you know a person has been drinking and manifests any of these symptoms, bring them to the emergency room as fast as possible or call your local emergency number. Learn to help save the life of a family member or friend by taking part in a St Mark James training program with Mississauga First Aid.